Place to fur on a hanger in a plastic bag. Put 1 CUP of coffee grounds in the bottom of the bag and seal the bag for 2 days. After 2 days, remove the coat and allow it to air out, allowing the coffee smell to dissipate. Mix in a spray bottle and spray 8-10 inches away from the fur. Then take a pet brush and brush GENTLY in the direction of the fur grain. This is usually downward, like how you brush your pet. The alcohol and vinegar remove the dirt and mildew smells from the fur. The hydrogen peroxide eats the stains. You can spray the solution on the lining as well. Allow the fur to dry and air out for a day or two, then store it in a cool dry place with a COTTON pillow case over the top of it. BE SURE IT IS COMPLETELY DRY or it will mold! Normally it is OK to wear your fur in snow or light rain. The guard-hairs and natural oils in fur should cause water to run off and not penetrate the leather under the fur. But, should water soak through to the leather it is important to take it to a qualified furrier as soon as possible. A furrier will know what procedure to perform to prevent your investment from misshaping from either shrinkage and stretching. Do not store your fur in a plastic bag of any type while at home or in a storage facility. Fur needs to breathe. Plastic will make the fur fall out and the hide get brittle. Cover your fur with a cotton pillow case. This will help keep a fur nice as long as it has room to breath and isn’t crunched together. Hang your fur away from heat sources such as radiators and heat vents. Choose the coolest room in the house preferably with air conditioning, and store it in the closet. Place moth traps in the room where you store your furs. This will help keep your fur safe. Do NOT store your fur in a freezer! One may ask, “Why not just freeze it?” You may think that would suspend your fur in time, and this is true. But, if we think back to 5th Grade science class, we remember that when water freezes, it expands. When freezing and thawing is repeated season after season the expansion and contraction stresses, stretches and tears the material on a molecular level and actually speeds up deterioration. The same concept is demonstrated on city streets every spring thaw when pot holes appear. Also, frozen materials become brittle, risking cracking and breakage. Never store your fur in a cedar closet or cedar chest. The oils from the cedar wood pull moisture out of the hide and make it brittle. You CAN place cedar wood sachets in the pockets to help keep the moths away, but only one per pocket. I put 1/2 inch cedar wood balls in my fur pockets and they work great! They can be purchased online for a few dollars. Never store your fur with moth balls. Moth balls are made from naphthalene, a toxic hydrocarbon derived from coal tar. Moth balls react with moisture in the air (and in the natural oils of your fur) and exudes gas acting as a fumigant. This chemical reaction can cause irreparable damage to fur and leather very quickly. Please note: Mothballs are a danger to both children and pets and can be fatal if swallowed. Naphthalene has also been linked to nasal cancer. You can clean your furs at HOME during winter months with LANA’S FUR CLEANER. Lana’s Fur has many fur cleaning products that work wonders! For example, Lana’s Fur Cleaning Kit has everything you need to revive an old fur coat and make it look new again. Read more here! During the summer months, have your fur garment cleaned by Authorized Fur care Specialist SM methods only. Dry-cleaning, washing or laundering may severely damage your fur. For vintage furs, you can use my recipe below, but only as a last resort. Use broad-shouldered PADDED hangers when hanging a fur garment. One of the beauties of fur is that it can be repaired or remodeled over time to provide a garment that can be worn for many years, through many phases of fashion. If part of your fur has been worn away, matching fur can be sewn in to replace the worn areas. If you are crafty, you can do this yourself. Soon, I will upload a video to show you how. 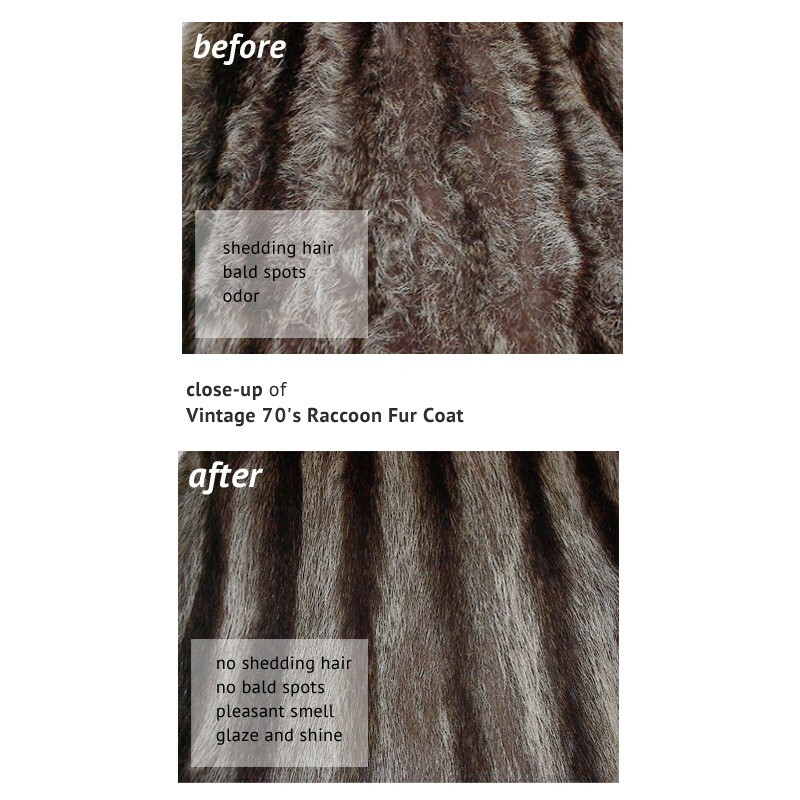 If you fur is dry and old, you can use Lana’s DRY THERAPY to revitalize your vintage fur coat. Yes, it is OK to wear your fur in snow or light rain as long as you shake it out and let it dry. Never store a fur coat wet.